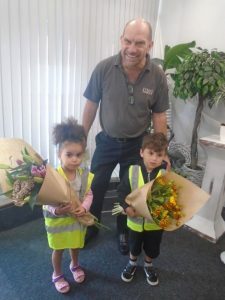 Green-fingered youngsters from our Crabbs Cross Nursery visited The Nursery Shop florist last week to support their learning. A group of children collected some beautiful flowers to display around their rooms and use as part of the nursery’s Curiosity Approach – which encourages children to use their imaginations and explore different ways of using everyday items. The flowers will be used to make potions and perfumes, floral displays and for art sessions, which will support the children in using their imaginations and creativity. And the florist generously agreed to donate their spare stock to the nursery each week. 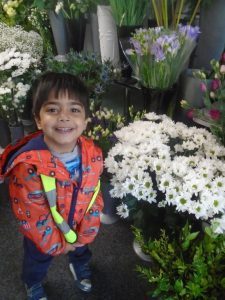 Nursery Manager Lorraine Ashford said: “The children loved their visit to The Nursery Shop with many of them commenting on the lovely colours and smells. 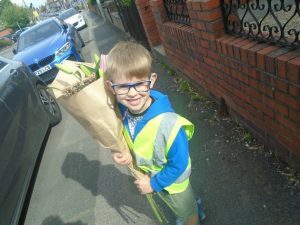 We also focused on road safety, donning our high vis jackets for the walk there and they tested their maths skills too when paying for the flowers.